Loudoun County is 1 of only 3 districts in the state without universal full-day kindergarten. Loudoun County residents and teachers want full-day kindergarten now. The School Board adopted operating budget last year included an expansion of full-day kindergarten to 5 more Title I eligible schools: Middleburg, Forest Grove, Sterling, Meadowland, and Frederick Douglass at a cost of $895,854. This service expansion was proposed by Sterling School Board member Brenda Sheridan and unanimously approved by the School Board. All of these schools already had the space to support this, so the cost was only to hire teachers. At the many public hearings for the budget with the School Board and Board of Supervisors, this was one of the most mentioned items supported by the speakers. After the Board of Supervisors underfunded the School Board's budget by $38 million, SOS Loudoun asked the community for what your priorities were, in order to further pursue these with the School Board in its reconciliation process. Expanding full-day kindergarten was the 3rd highest vote-getter. The School Board ended up cutting the expansion from the budget, the only improvement SOS Loudoun pushed for that was not funded. Now, only 21% of LCPS kindergarten students receive a full day of kindergarten. Last week, the Superintendent proposed his Capital Improvement Plan (CIP) for fiscal years 2016 - 2020. This is a five-year plan for needed new construction and expansions. Full-day kindergarten didn't make the first draft. It was listed as a possible discussion item. It has been discussed in years past as well. In 2012, LCPS estimated the cost at $51 million to expand existing schools to provide the space for full-day kindergarten. 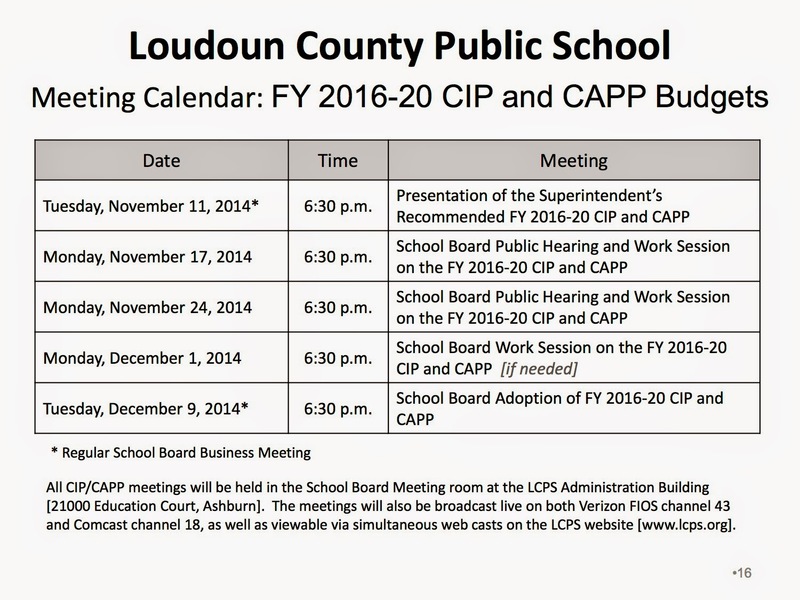 Often, items appear on the CIP to be funded in future years but are never approved for funding or are regularly delayed, such as the recently successfully funded Academies of Loudoun. Full-day kindergarten has yet to make it to a "to be funded" year. Although it wasn't in the CIPs in prior years, the County was able to fund renovations and expansion to Broad Run High School at a cost of $26 million this year. This was added in its first year to be funded that year and received School Board and Board of Supervisors support after a strong showing at the CIP public hearings by Broad Run High supporters. Similarly, the School Board's approved CIP last year included a $6 million request for design of the Academies of Loudoun in FY2015 and $108 million for construction of the project in FY2016. The Board of Supervisors then decided to combine both requests into FY2015. We could afford it. This past week, the School Board voted to request its state delegates change Virginia law so that they can charge parents a user fee for full-day kindergarten. They said that this would cover the cost of facility expansion for full-day kindergarten, which they said we can't currently afford. The expansion of facilities to support full-day kindergarten was estimated last year to cost in full $53 million. (It gets more expensive every year we wait.) This year's proposed CIP lists $71 million in improvements for FY2016 and only $43 milion in improvements in FY2017. The total CIP cost for all five years is $165 million less than last year's plan. It seems we could easily add the cost of full-day kindergarten expansion to this plan and still be under the recommended debt limits by the Board of Supervisors without any need for user fees. Public hearings are Monday, November 17 and November 24 at 6:30pm at the School Administration Building at 21000 Education Ct in Ashburn. Call (571) 252-1020 to sign up in advance to speak or sign up in person prior to the meeting. Contact the School Board at lcsb@lcps.org.